An exciting update to our popular roller coaster, the Typhoon has an extra long track and incorporates the newest color-changing LED technology. Cars lock into the track on this unique addition to our World's Fair line. Plays 25 Christmas carols and 25 year-round classics. UL listed A/C adapter included. Brand new with original box unopened. Stored in a smoke free environment. 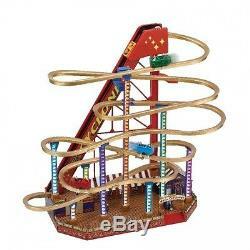 Christmas World's Fair Rollercoaster #79751 NEW FREE SHIPPING 48 STATES" is in sale since Thursday, November 05, 2015. This item is in the category "Collectibles\Holiday & Seasonal\Christmas\ Current (1991-Now)\Other Current Christmas Décor". The seller is "frigingenius" and is located in Kokomo, Indiana. This item can be shipped worldwide.